Description: HOW ABOUT THEM EMD'S?? Description: CSX 6156 in need of a new paint job, was Chessie System-WM 4257. Description: Making a short run south, in reverse. Description: This lone locomotive is CSXT F-730-29 westbound at Weldon, NC on the Roanoke Rapids Sub. At this time its was being used for the Operation Lifesaver Rail Safety for Emergency Responders class. 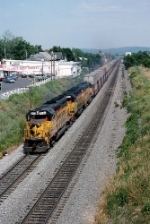 Title: Its me on CSXT 6156! Description: Guess who! Its me! My dad took this photo of me in the cab of CSXT 6156, F-730-29 during the OL RSER class at Weldon. Description: The obligatory shot of the CSX power idling at Lansdale taken just before boarding a southbound SEPTA to Philly. These two ex-Chessie/WM GP40-2s were for B738. Description: Hollow Road, 1437 hours.